Hubby took me to the museum. As he went to buy tickets, I waited on the side (it's 20 rupees for a Pakistani, and a 100 for a foreigner, so he wanted me out of sight to buy the cheaper one for me ;) On entry we got away with it :D). While I was waiting, looking around the place, two slightly older men were passing by. Well, I might not know Urdu very well, but I did understand when one said to another: "Look, there's gori". They looked at me for a brief moment, and went away. When Hubby came, I told him about it, laughing that if I could actually speak Urdu, I should've replied that I'm not gori, but using "Fair and lovely" (skin-whitening cream; by the way, while we are obsessed about getting tanned, they are obsessed about getting whiter - you should see all those adverts of bleaching face creams!). Once we finished our tour of the Fort, I was taking a few pictures outside. Couple of men were staring at me, clearly making comments about my appearance. Of course I didn't understand too much, but as they kept staring, I laughed to Hubby that I'm attracting attention again, and they talk about me right next to me, thinking I don't know that. He then talked to them, laughing that if they want to talk about the gori, next time they should be more discreet because this one knew they were talking about her ;) They were quite polite though, apparently they were just amazed that gori is covering up like a Pakistani girl. One evening we went to the big shopping centre and a supermarket. Once we were done and heading towards the car, I heard Hubby, who was walking behind me, arguing with someone. I had to ask him what was going on, and apparently the group of young boys was commenting on my appearance and deliberating whether they should take a cheeky picture of me. As you can imagine, Hubby wasn't too happy and made it clear to them what he thought about their behaviour. Actually I didn't feel people staring at me that much - well, at least in Lahore, village is a different story ;). Even though we stayed in the area that's not the main tourist destination, as long as I tried to blend in, I didn't seem to attract that much attention. Or at least I didn't notice it that much. Actually, what surprised me, people seemed to notice me more in the areas, where I'd expect tourists to be more common, while in the small markets and streets around the house I could go almost unnoticed. Once we got back to the UK, I was also told by a Hubby's cousin that a few years back when they'd go to Pakistan, random men would try to "accidentally" touch the girls passing by (even though they are also Pakistani) - nothing like that ever happened to me, and I was really surprised to hear that (I've heard this about India quite a few times though). I'm sorry that you have experienced some negative feedback, it seems so silly that such a small difference can be seen as something people want to pick up on instead of you as a person. It seems to be the way though if you are different in any way people will look to see why, I suppose it's human nature. Really interested to hear about your experiences. Shocked though that they charge more for foreigners to visit places - it doesn't seem very welcoming and so much more too. Had to laugh about the idea of being treated like a celebrity for having a white face. I'm staggered they're allowed to charge different rates for 'foreigners'. I think I'd find that level of attention disconcerting and quite offensive if I'm honest. A very interested read! You were almost a celebrity :D How annoying though to have to pay more for a visit somewhere if you are a foreigner! It's very interesting to read about your experiences and your perspective. I can't believe that foreigners have to pay so much more than locals to go in to those attractions! I can't believe they charged you so much more at the museum, I have to admit your stories made me smile. Witaj! Miałam podobne przygody podczas mojej wizyty w Lahore, i tak samo jak Ty w zoo czułam się najchętniej ogladanym i komentowanym "obiektem" ;) ja nie zakrywalam włosów a ze mam blond wiec nieźle zamieszanie wprowadzałam... Jak długo tam jeszcze zabawisz? Pozdrawiam! Hej! No z blond włosami musiałaś robić furorę, ja wystarczająco niekomfortowo się czułam z moim myszowatym kolorem :D Niestety już dawno wróciliśmy do Anglii, ale nie udało mi się nic napisać w trakcie pobytu, więc spisuję wspominki :) Pozdrawiam! Your outfit is stunning! Really lovely. It was like this when we visited India, lots of people taking photos which I found quite embarrassing!! I love your outfit, gorgeous!! I've taken a bit of a sneaky look around your blog this evening and discovered more about Halal than I knew before. Very interesting. As others have said - I can't believe you were charged more as a foreigner! Have had similar with my blonde children in dark haired countries, but not quite so often! How I wish we were all satisfied with ourselves tho, sad to hear while we are fake tanning they are trying to be fairer skinned - we are all beautiful just as we are! Oh my! I'm glad my child looks more Asian, I would snap if a stranger tried to stroke him! 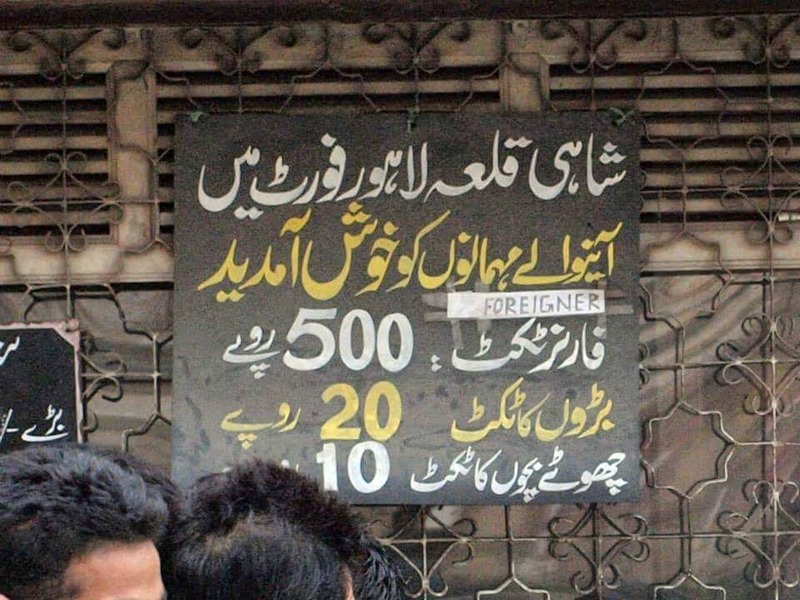 Wow, I knew that prices are higher for foreigners but I had no idea that are that much higher!